Brother Apoko alias Ringtone has been making headlines recently, attacking both local and international, Gospel and Secular artists. Lately, he was onto Wasafi artists´ case and fans question his intent. I find your pendant to be very questionable. Hata sisi wakatoliki hatutembeangi tu na some weird bling in the name of a rosary. Bukosi But sometimes you are too much. Ril blac Please start the prayers with your friends then neighbors then mtaa then kitongoji then province then neighboring states then the whole country so when you see that you have changed alot of lives through that then come to Diamond, Rayvanny and Harmonize, am sure they will listen. Gervasmedard So wat beef do you have with Dee [Diamond] ama juu ulikataliwa na Zari sasaa unataka Tanasha? Wat makes you think ur do holy in judging others? U nid to seesam med n spiritual checkup. Belinda Shontelle Y tag diamond platinumz and his crew unatafuta kiki Tanzania ama Nesh Chibu This man [Ringtone] thinks he is Righteous plzz stop this nonsense wasafi ataokota tu wakijistkia tu Sharon6037 Does anyone know where brain is sold??? Am asking for a friend. Hehe! Deep. I found your match go marry (Msupa S) you two can twin together. Hi kiherehere imezidi. d wangui Sasa huskiangi aibu ju wenye unatag hakuna mmoja ashai jaribu kureply. Shiksbeth please keep quiet for the sake of kisiis… watu wasitujue vibaya  Pale blue dot Yeap! That was just but a part of the feedback fans had for Brother Apoko. 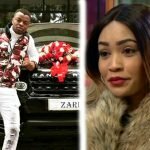 The post ¨Ama juu ulikataliwa na Zari sasaa unataka Tanasha?¨ Ringtone´s fans strike back appeared first on Ghafla! Kenya.